The Oldest and still the best in Mumbai city, This Shivaji museum has more then forty to fifty thousand varieties of ancient artefacts, major categorized as natural historic collection, archaeology and art works from around India. Major attractions being the weapons used by Shivaji Maharaj and his warriors. These are pure heavy weight iron outfits to safeguard self they use to wear and fight the battle. A great example of health and fitness for those who cannot carry few kilogram weight and walk around the city. Such museums are kind of inspiration to keep oneself fit and healthy. Moving ahead one can also see those British era forest rocks, timber and fossils collections at one corner of this Shivaji Museum. Another attraction of this museum since 2008 is the new mythological section with idols and art work of lord Vishnu and Krishna since decades. If you love and are impressed with Archaeological collection like old weapons, the classic style fishing hooks of the Indus Valley Era, then this section of Museum will sure attract you. Since 1919, the Buddhist collection like Stupa of Mirpurkhas can also be seen here. For art lovers, their is a huge collection and varieties of Mughal era paintings, those were days of sultan and rajas, and the artwork collection from around India locations like Rajasthan and other cities of north is awesome. Shivaji museum is also famous for its old coin collections (Gold and Silver) and other metal coins. Those were mixed and special metal made of ivories etc from rich earth of India, Still available on for public display since the museum started in 1904. One more section around displaying the textile age traditional and religious collection of India. Sculptures : Dvarapala Yaksha, Buddha Visits The Brahmin Kashyapa, Shiva Gana, Shiva, Brahma. Miniature Paintings : Keshalocha Of Mahavira (Plucking Of Hair), Chanda Talking To A Friend In The Garden, Jahangir Distributing Alms At The Dargah Of Ajmer, Black Buck And Doe, Meeting Of Rama And Parashurama. Indian Coins : Punch-marked Coins, Coin Of King Menander, Coin Of Chandragupta Ii, Coin Of Emperor Jahangir (1605-1628), Hon Of Chatrapati Shivaji Maharaj. Far Eastern Art : Ewer With Peacock And Peonies, Table Screen, Bowl, Vase In The Shape Of An Incense Burner, Snuff Bottles. Arms and Armour : Personal Armour Of Emperor Akbar, Shield Of Emperor Akbar, Types Of Maratha Arms, Two Major Talwars (The Swords). European Oil Paintings : Bohemian Gypsies, Adoration, Jamsetji N. Tata, The Epiphany Or Adoration Of The Magi, Feeding The Parrot. Pre and Proto History : Jewellery, Maze, Bird On Wheel. Modern and Contemporary Art : Death of a Pope ( Since 1961, By Francis Newton Souza), Its a Oil on Canvas collection. Decorative Art : Bowl, Jewellery Box, Portrait Of Thirumala Nayaka, Rice Bowl. Textiles : (Silk, Patola and Patan), Shawl, Sari, 164 Sari. Natural History Section : The Kashmir Stag Or Hangul, Bearded Vulture, White Tiger, Great Indian Bustard, Great Horn bill. Special attractions during November 2012, Which continued for next 4 Months was Ancient Egyptian Mummies Exhibition, a One of it kind of experience in Mumbai which gained a huge footfall. Reaching : Nearest Station being CST (Chatrapati Shivaji Terminus) in Central Railway Route and Churchgate Station At Western Railway Route. One needs to take bus or taxi and can reach with in 10 to 15 minutes. Via International / Local Airport : In Any case you are at Andheri or Santacruz (Mumbai Suburb) and Museum is far, See Andheri Airport to CST distance. So Hiring cool cab, taxi or getting into Local trains towards Churchgate station (Last Station) is preferred. Wheelchair facilities for disabled and other like elevators and ramp are also available. Free audio guide for to NRI Tourists who pays entry fees of Rs. 300 and Rs. 100 charged to locals. Available audio languages are English, German, French, Spanish and Japanese. Family audio guide costs Rs. 300 ( 2 Children and 2 Adults). Indian regional language audio guide also available in Hindi and Marathi language costing Rs. 75 and Rs. 200 for family. One is allowed take cameras and take pictures and videos inside Shivaji Museum Gallery, Below are the charges for the same (Might Have Changed Now). Kindly note that flash in cameras and tripods are not permitted. Closed : During Monday and Public / Bank Holidays like 26th January, 1st May, August 15th and October 2nd. Pin code – 400023, Maharashtra (India). Landmark : FORT, Near to Regal Cinema, National Gallery of Modem Art (NGMA) and Jahangir Art Gallery. 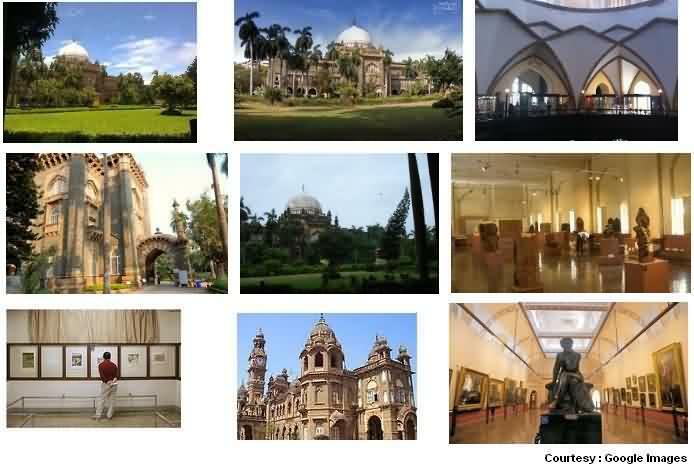 Every now and then various events are organized at this famous Museum of Mumbai. Some of the events like ‘Paramparik Karigar Exhibition Event by Indigenous Arts‘ by an NGO who works towards and promotes art and craft work from all over India. Its all about promoting and showcasing artwork by 12 not so famous yet good artists with their unique 25 artwork, also available for sale with price ranging between 1500 to 50000 Rupees (INR). Artwork was made of combination ceramics and many other form of artwork from around Indian cites and states like Rajasthan, Gujarat and South India (Andra Pradesh) by ‘Kalamkari’, ‘Phad and Picwai’ and ‘Mata Ni Pachadi’ artists. The display location inside this Museum is ‘Coomaraswamy Hall’. EVENT TIMINGS : Morning 11 Am to 7 Pm, Contact : +912222844484. In May 2014 , CSMVS (i.e this Shivaji Museum of Mumbai) started a unique way of interacting and educating kids via a concept called ‘Museum Kids Club’. An idea of doing something for small kids / children of Mumbai which already sowed in authorities mind during an event in 2008 which was called ‘Toy Exhibition’, which was a huge success. So was the new thing inside Museum called ‘Kids Club’. This ‘Kids club’ is a monthly activity event done one a month at any selected Saturday. With lots of activities and workshops that will help kids with information and other stuff via its themed based programs and more. It helps develop physical and mental abilities, thinking skills of participant kids. Museum charges one time annual feel of 2200 per kid (Half Yearly Payment Option Also Available) which gives free access to Museum and all planned activities. It also benefits family members with free entry inside this famous Shivaji Museum of Mumbai. Taking a step further, CSMVS has decided to use the vacant available space of more than 3000 square feet as a dedicated ‘Children Museum’ (Since 2016). This new Children museum section showcases some real old and historic, Indian traditional, Unique wooden toys, Workshops, Art sessions, Puppet making events, Pottery work, Craft art and much more. Some unique display would be old traditional Panchatantra which is about 400 years old now, Historic China, Japan and Harappa era monumental toys and artefacts. These showcase in the form of dedicated museum for kids gives more learning options and creates curiosity and interest in kids for cultural development and a recreation activity which by more anyway has less options in any other ways around Mumbai city. YOU MIGHT BE INTERESTING : New Shivaji Memorial in Mumbai Sea, Mobai Bhavan Museum, Innovative Museum On Bus Wheels, RBI Monetary Museum, New Museum at Mumbai Airport T2 and Complete list inside Mumbai city.